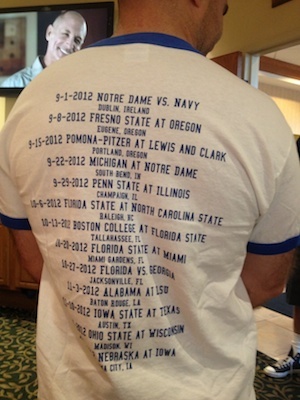 Even Joe Paterno, in his career, missed a couple of those games. John hasn't. Granted, he is paid to attend these games. Terry, who hasn't missed a game anywhere since 1990, pays his own airfare and it's on his own time. That's a huge difference. Still, John Black has not been sick, had a funeral to attend, or had a family conflict of any kind (to our knowledge). That's truly amazing. And the best part is John's knowledge about Penn State football. His letters are fun to read and just by themselves, worth the price of admission of becoming a member of the Penn State Alumni Association. At any away game, John always looks to see if we are present, and we always look for him. John is always relieved when he sees us, he is worried that something prevented us from coming to a game. We feel the same way about him. He is a mainstay of Penn State football, and I can't even imagine what would happen without his weekly perspective on the game and his cheery disposition. But as stable as John is at away games, there are also surprises, people whom you have not met before, but who have an interesting story. That happened to us in Champaign, over breakfast at the hotel. That's where we met Jason Hosch and his family. 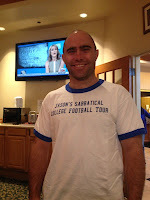 Jason is a Penn State alumnus, a former Penn State Blue Band member. But I didn't know that when I first met him. What attracted me was his t-shirt, as shown here. Wow. There are some great games and some great college football venues. Turns out that Jason works for Intel Corporation in Oregon, and every seven years, he's allowed to take a sabbatical. Sound like academia? Only if you're tenured, which I'm not. So my jealousy at being able to take several months off to follow college football was at a very high level. And my feelings toward Intel as being a very enlightened company in supporting employee growth has elevated tremendously. I asked Jason why not Beaver Stadium? That's when he told me he was a Penn State graduate so he has already been there...I needed to read his blog to get the rest of the story that he was a member of the Blue Band...Jason's blog is a good one...looks like he will be fun to follow! You can follow it yourself by clicking here. When we arrived at our seats in Memorial Stadium, we met Chuck. I never learned his last name. He was a delight to sit next to, a Penn State alumnus who graduated in the 1960's who told me that he never changes the words to the third verse of the Penn State alma mater: "When we stood at boyhood's gate" (now it's childhood's gate). His reason? He truly believes that he arrived at Penn State as a farm boy from a small country town and graduated from Penn State as a man. Chuck is a dedicated alumnus, having graduated with a secondary education degree. He has been successful enough in his chosen profession to help fund education scholarships at Penn State, and he has also been active as a college football official both at the collegiate and at the high school levels. Very knowledgeable about college football, he was a fun football fan to sit next to. Today Chuck officiates high school games near Pittsburgh on Friday nights, and after the game he drives to Altoona, to a budget motel, where he is a regular for any Penn State home game, arriving at about 2 a.m. to get ready for the Penn State game on Saturday. He also travels to many of the B1G away games, his favorite venues being Michigan State and Purdue. Such a dedicated fan! On the way to the game, we met one other group of Penn Staters: two brothers, Penn State alums, and their son/nephew. One alum, a Smeal College grad, confessed that he was a lousy student, but he had worked himself up to become a CFO at a company. The other was a trader for an oil company. They asked us how the atmosphere was back at University Park after the Sandusky scandal. 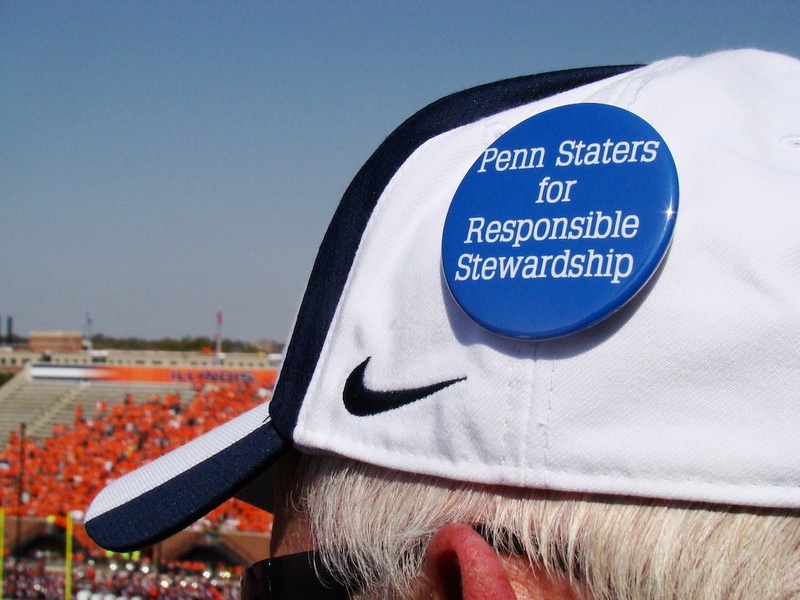 Try as you might, it's a topic you can't avoid whenever Penn Staters gather. We explained as best we could our feelings about the situation. What resulted was an email from the Chicago-based trader, inviting Penn State Smeal College students to apply for a summer internship at his company. That felt good! And so typical of Penn Staters to want to take care of their own at a time of great angst. Away games are fun. You meet so many good people, all faithful Penn State fans, whose love for their university is strong even in these troubled times. All have different reasons for being at that particular game of the season, and you never know when a chance conversation can turn into an encounter of significance. It's part of the reason we keep doing this.